Regular readers of this column might have guessed that I'm something of a fan of Synodontis. They're one of my "go to guys" when I've got a catfish of the month to write and inspiration isn't immediately forthcoming. They're also a bit out of fashion at the moment and I have to admit to not having any in my tanks right now, but that is a rare thing for me - I usually have a few species to observe. I think that perhaps the most engaging thing about Synodontis is that they are hardy. They cope with the rigours of international travel well and adapt to life in the aquarium with hardly a second glance. This is why they can sometimes attract high prices as well; you know you're taking less of a risk with a Synodontis because they are hardly and long lived. Therefore I'd suggest that, if you find an unusual Synodontis for sale, even if it is a little pricey, you or are not yet a fan of this genus, snap them up and give them a try! This month's featured catfish is near the top of the list in this regard, they're not exorbitantly expensive, but when they are offered for sale they are a great buy. Due to their relatively small size and peaceful temperament they are a good candidate for a community tank. 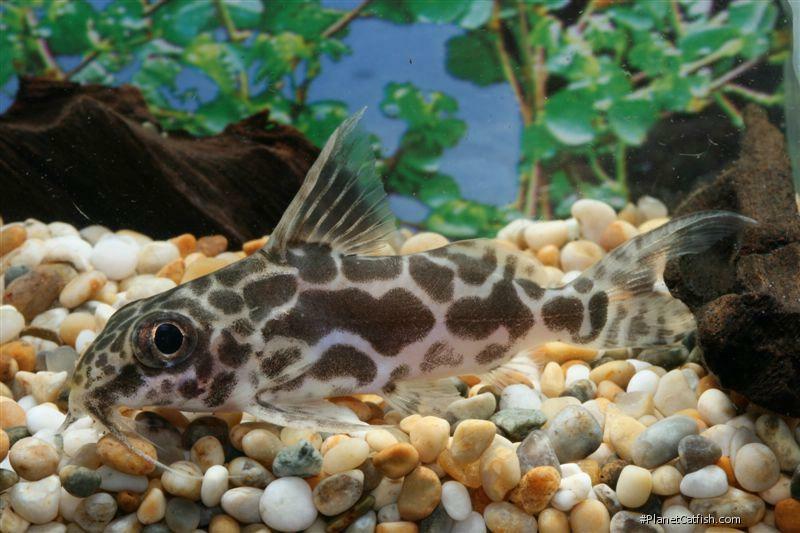 Within such a large genus however (despite all those exotic plecos, Synodontis is second only to Corydoras in terms of the number of species available to the hobbyist), this species can be confused with the much larger Synodontis caudalis. Irrespective of the size and colouration of the fish, look to the eyes to tell these two similar species apart, S. robertsi has really large eyes in relation to this size of its head. Described to science by Poll in 1974 from a single specimen which was caught in the Lukenier River in the Democratic Republic of the Congo, its place of origin is perhaps a reason why imports of this species have been intermittent at best. While a shy fish, a giraffe-like colouration makes this an appealing species to keep your beady eye out for when African shipments arrive at your local fish store. Type Locality Elombe, Lukenie R., Zaire, 2°49'S, 18°14'E. Etymology Synodontis: From the Greek syn, meaning together, and odontos, meaning tooth; in reference to the closely-spaced lower jaw teeth. Named after Tyson Roberts of the Museum of Comparative Zoology, Harvard. A small fish, as Synodontis go. Colour pattern like that of a giraffe, a brown background with white or yellow worm lines. Transparent fin membranes with brown spots. Strongly forked caudal fin. Large eyes. Similar to the much larger (20cm) S. caudalis . Other Parameters Excessively low pH (below 6.0) will result in erosion of fin rays and membranes. Feeding Not a fussy eater. Will accept flake and tablet food. Especially enjoys live and frozen bloodworm and brine shrimp. Furniture Hiding places provided by plant cover. Compatibility A small, peaceful fish that is a model citizen in a community tank. Not very shy, but appreciates plant cover. Suggested Tankmates Not good with boisterours fish, ideal tankmate for African characins. Breeding Not yet successfully bred in captivity. There are 14 registered keepers, view all "my cats" data.